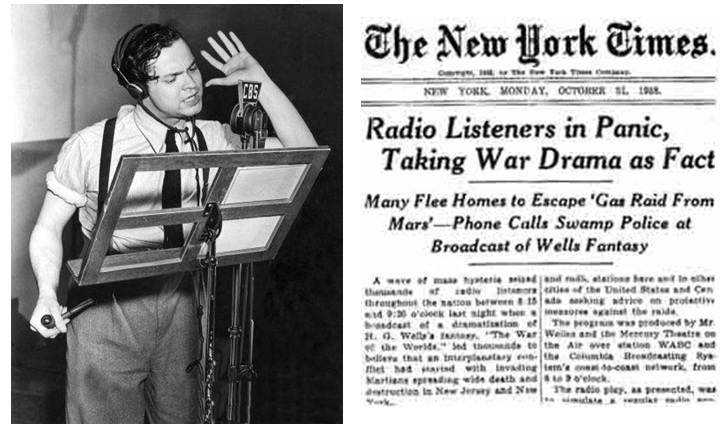 80 years ago today, October 30, 1938, a young actor narrated and directed a radio adaptation of the classic sci-fi novel, War of the Worlds by H.G. Wells. The script was written by playwright Howard Koch and the young actor was Orson Welles. The radio play was an episode of The Mercury Theatre on the Air broadcast and was aired on the CBS network. As many of you may know, many listeners were convinced that a Martian invasion really was happening. Since the program was scripted as a music show which was continually interrupted by news bulletins it was difficult for those who had tuned in late and had missed announcer Dan Seymour's introduction, to tell fact from fiction. 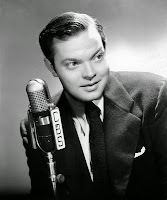 Well, we stumbled upon this little snippet of Orson Welles chatting about the response to the broadcast some 15 or 20 years after the fact and we thought we'd share it with you today. Happy World Audio Drama Day! Listen to the full original broadcast of War of the Worlds on the Internet Archive. And read all about the broadcast and aftermath on Wikipedia.